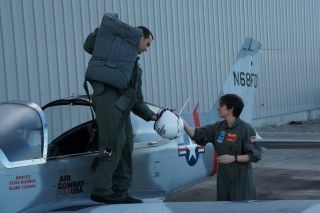 SPACE.com staff writer Miriam Kramer gets her helmet ready with the pilot Russell Campbell before flying the Marchetti SF 260. CAPE CANAVERAL, Fla. — "Get ready for the Gs!" Those are the last words I heard from my pilot before four times the force of gravity pinned my arms, legs and the rest of my body to my seat in the Marchetti SF 260 I flew on Friday (Dec. 6) here at Air Combat USA. The four Gs pressing me down were created when Russell Campbell, a former Air Force pilot, took the Marchetti into a spiral while plunging toward Earth's surface. Just before the spiral, however, everything was peaceful. We took off into a beautiful morning over the East Coast. The sun glinted off the Atlantic Ocean as the Marchetti climbed higher and higher. At one point, Campbell even allowed me to take over control of the aircraft. Even the slightest touch of the joystick moves the plane in somewhat extreme ways. It takes a light touch. At five or 10 minutes into the flight the real fun began. We flew a parabola that resulted in about 10 seconds of weightlessness — a unique experience for someone who had never been in a small plane or outer space — and then came the Gs. I clenched every muscle in my body and tried to remember the breathing exercises the instructors taught us before leaving the tarmac, but at a certain point, my more base instincts took over and I just held on for the ride. That particular maneuver was used to simulate what a flight on XCOR Aerospace's Lynx suborbital space plane could be like for 23 AXE Apollo Space Academy spaceflight winners of a free flight aboard the Lynx. Campbell took me through a few other acrobatic maneuvers in formation with another Marchetti flying alongside us before landing softly back on the ground. At one point, I was upside down as the Earth stretched beneath my head, an unforgettable view and just one part of an incredible experience. Miriam Kramer visited Florida with the AXE Apollo Space Academy team to experience the spaceflight training firsthand on a trip partially paid for by AXE.